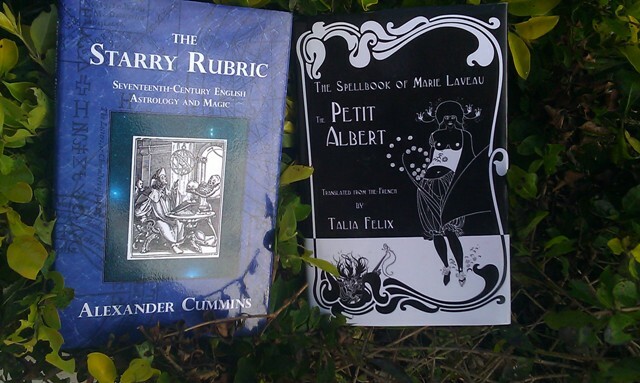 The first book is Talia Felix’ translation of the French Grimoire Le Petit Albert, The Little Albert, that like many other French grimoires influenced the Western and Caribbean magic in dramatic ways. This book that came out in several editions from 1702 and into the early 19th Century is now presented in its first published English translation, and I only wonder why it took so long. What is fascinating with this little volume is the range of recipes provided. We find here material originating from the Solomonic Tradition, Picatrix, astrological almanacs, but also material taken - and transformed – from Villanova and Clairvaux handbooks of health. We find recipes for making various forms of waters side by side with wine recipes, formulae’s of the thief’s vinegar, hand of glory and a great amount of material dealing with the celestial realms and the making of talismans and much material is derived from – or ascribed to - Paracelsus. Many of these formulas clearly inspired later hoodoo men and woman in the various ways of generating their mojo bags and other hoodoo workings, a factor also noticed by Felix who suggest that this work also influenced the Vodou Queen of New Orleans, Marie Laveau. This book is not only interesting because of its arsenal of magical workings, but also because it gives us an idea of the traditional worldview the grimoires where developed within. The Petit Albert introduces us to formulaes of a practical, pragmatic, celestial and infernal nature – and I find this to be crucial for understanding the pre modern world. It was always about using the right tools for obtaining a given goal. Angels and ‘demons’ danced around in the same world and who we approached was mediated by pragmatic interest and a god-fearing disposition. It is a spell book absolutely, but it is also a little treasure in so many other ways and I hope this little volume will find a home in many libraries. It is truly a gem. Speaking of the Traditional World View we find another book expounding on this theme in academic ways. Alexander Cummins’ The Starry Rubric in his post graduate thesis expands on the role of astrology in the 17th Century Britain. In doing this he also brings our attention to the importance of practical and traditional astrology in the understanding of the Western Mystery Traditions. As he demonstrates; astrology was used as a reference for all forms of human activity. If it concerned the world, society or the man unique, astrology could always explain the fortune and misfortune – and held the remedy for thwarting both. In the 17th and 18th Century it was expected that any occultist or educated man (and the few woman of education) had a basic understanding of traditional astrology, because in an enchanted world, the movements of the stars and planets where god’s finger in action – and thus by understanding the divine script in the stellar heavens we could become more understanding in general. As a traditional astrologer myself I welcome this book, as a Traditionalist, I welcome this book because it presents the pillars of astrology and traditionalism is such clear and concise ways. I would say; if the ‘traditional worldview’ is a concept difficult to grasp, read this book, it will give a clear and lucid idea about the importance of astrology in how pre-modern men and woman understood the world and society. I can only congratulate Felix, Cummins and Hadean Press in making such treasures available for us. So visit Hadean Press at: http://www.hadeanpress.com/ and find food for mind and heart.